Ash is getting ready to revisit his hometown in the upcoming Ash Vs. Evil Dead Season 2. And it promises to give us a side of the man with the chainsaw hand we've never seen before. We already know that Lee Majors is stepping in to play Ashley William's dad Brock Williams. But with this introduction comes some unexpected character development for our hero. Ash Vs. Evil Dead came as one of 2015's bigger surprises in the sheer fact that it didn't disappoint fans. Original creator Sam Raimi stepped into direct the first episode, setting the tone. And while it sometimes looked a little on the 'cheap' side, these continuing adventures for Ashley Williams, Deadite Hunter, proved to be a lot of fun. Even though the show is now ready to step into some more serious business, don't expect the tone of Ash Vs. Evil Dead to change in its sophomore season. As we saw in the first look image released last week, Ash Vs. Evil Dead will pick right back up where last season left off. Ash is in the Florida Keys partying it up at a never ending kegger where he gets to show off some of the tricks he's learned over the years. And we're sure he'll get a few new ladies into his bed. But those Deadites are going to come calling once again. And it will bring Williams to some unexpected places. Says executive producer Craig DiGregorio. "Season 2 focuses on Ash going home and going back to his hometown. In that respect, you're learning about another side, which you haven't seen. In this season, I think you're going to learn more about what his life was like before he went to the cabin. What was his life like? Who were the people that he hung out with in high school? Maybe we'll see members of his family. . . . So, our plan for Season 2 is finding out more about Ash and his distinct past, before he read the book. Who was he and what was he really running away from? Ash Vs. 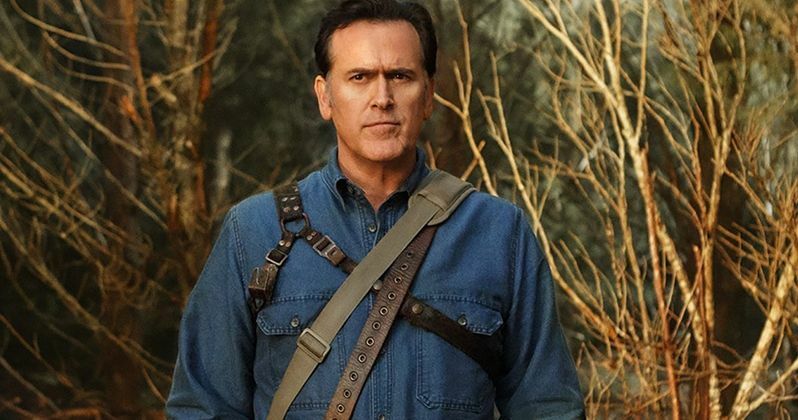 Evil Dead will finally give Ash an origin story of sorts without having to resort to an actual origin story. But at this point, flashbacks haven't been ruled out. This means we might actually get to see Ash as a kid, and as a high school punk. Though, none of that has been confirmed at this time. It does sound like a fun way to go in giving fans something different they haven't seen yet. While we know that Ash's dad Brock will be revealed for audiences, we haven't heard anything about Ashley's mother. Who would even play that character and do it justice? Along with what was revealed about Ash's past, Collider also found out that the classic Oldsmobile Delta 88, which has appeared in every Sam Raimi movie and TV show to date, will play an exceptionally crucial role in these continuing adventures. There is a chance that it, too, might get its own origin story. Craig DiGregorio says this. "The Delta will also be a big character, this season. There are certain big fan questions that I get asked, that I think we will have at least looked into doing. I won't say that we are or aren't doing something, but there are a lot of questions I get, and if you were to list out the five biggest questions, there are a couple that we definitely have looked into a lot. It feels like, for the first season, although we definitely imprinted a lot on what those 30 years were, when you picked Ash up at the beginning of the pilot, you could see what he was. There was only so much we could do to expand out who he was. But for this season, in particular, we're really defining what this guy was. Sam [Raimi] and I and Bruce [Campbell] are really defining who this guy was and we're building out the mythology of his life. To take one of your favorite childhood heroes, in quotes and with a question mark, and really flesh him out a bunch and see who he was is really cool." Ash Vs. Evil Dead Season 2 doesn't have a premiere date, but should arrive close to Halloween. While the show hasn't been renewed past these upcoming episodes, there is a 5 year plan in place, with a vague outline already drawn out. So, what do you think of this latest information? Pretty exciting, huh?